It’s that time again for another epic Sleepopolis mattress battle. Today’s head-to-head is Helix vs. Leesa. Both of these mattresses are extremely popular, although each takes a very different approach to providing the best mattress for sleepers. While the Leesa mattress fits the needs of most sleepers with a level of universal comfort (a “one mattress fits all” kind of approach), Helix takes a different approach (more like “one mattress fits one”) and uses a custom design for every sleeper based on the results of a personalized questionnaire. Will this unique approach be enough to knock Leesa off the podium? Or is the Leesa proof that one amazing mattress is better than hundreds of variations? Find out now in this mattress breakdown of Helix vs. Leesa. In a rush and just looking for the highlights? Click here to get right to the summary. 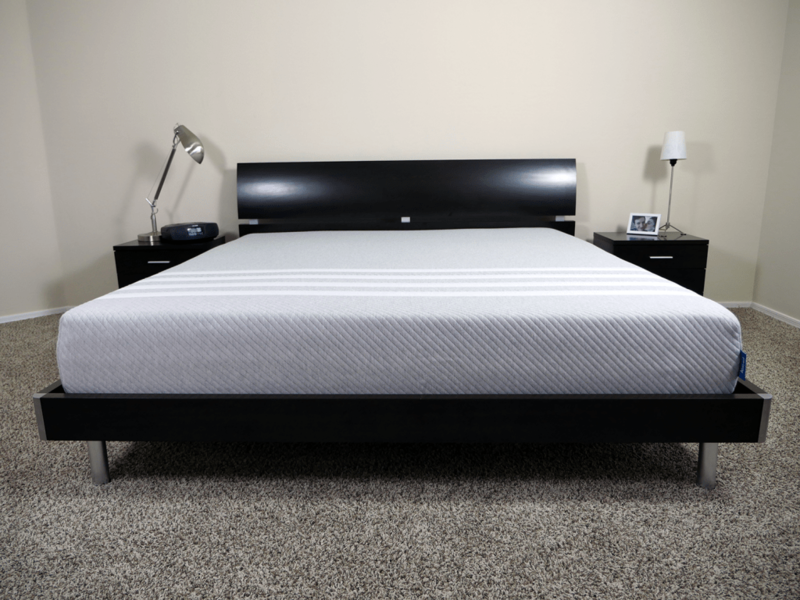 Enjoy $75 off the standard Helix mattress by using our exclusive discount codes! Helix Sleep made a unique decision when it decided its mattress would be built different for every sleeper. Although custom, each mattress is still built from four layers of poly foam and microcoils to complete the 10” total height. Sleepers start by taking a quick sleep quiz that asks about heights, weights, and a variety of sleep preferences. That information then translates into a firmness level and material selection. 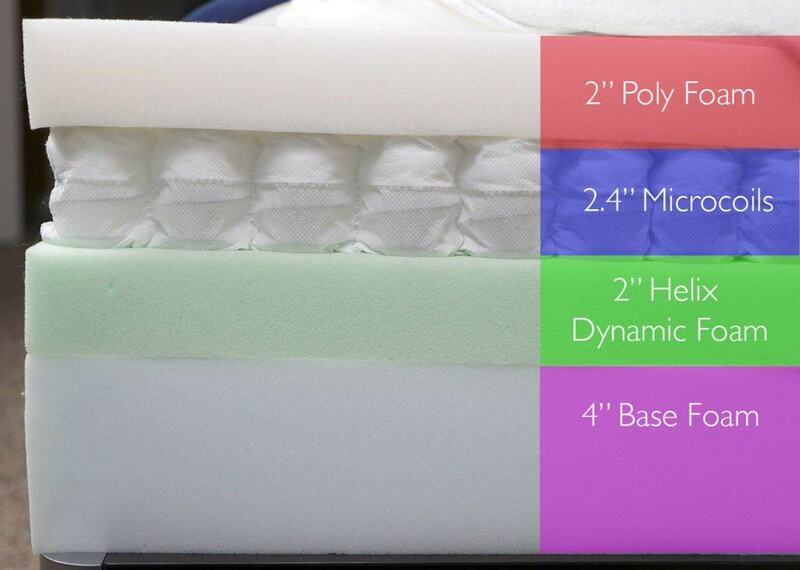 Many of the mattresses use the same materials, but based on the results of the quiz, the order of the layers within the mattress, the foam densities, and feel is varied. Top layer (comfort + cooling) – This layer is 2” of Helix Dynamic foam, which is a responsive comfort poly foam. This poly foam feels a bit like latex foam with great bounce, a faster response time, and good cooling. Based on the results of your quiz, this foam layer may be softer or firmer, but the main purpose of this top layer is comfort. 2nd layer (pressure relief + bounce) – This layer uses 2.4” of microcoils to provide pressure relief and bounce. 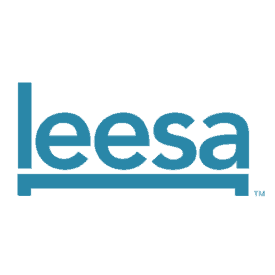 The microcoils also provide a degree of support. 3rd layer (support) – This layer is a 2” poly foam, and its primary purpose is support. This layer is a bit firmer than the layers above, creating a firmer feel for support and deep compression. This layer also serves as a transitional layer between the foundation and comfort layers. 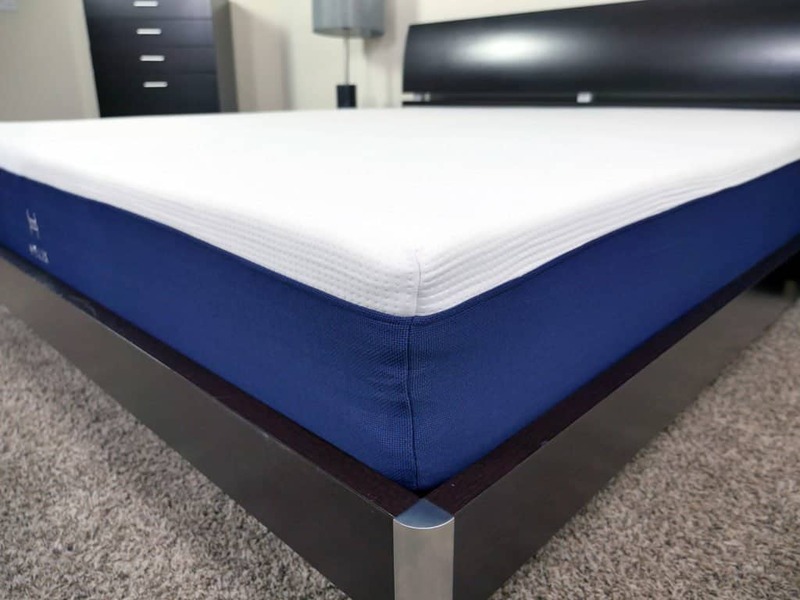 In some Helix configurations this layer is placed more towards the top of the mattress, as it can provide a much higher degree of firmness and support in the mattress as a whole, where necessary. 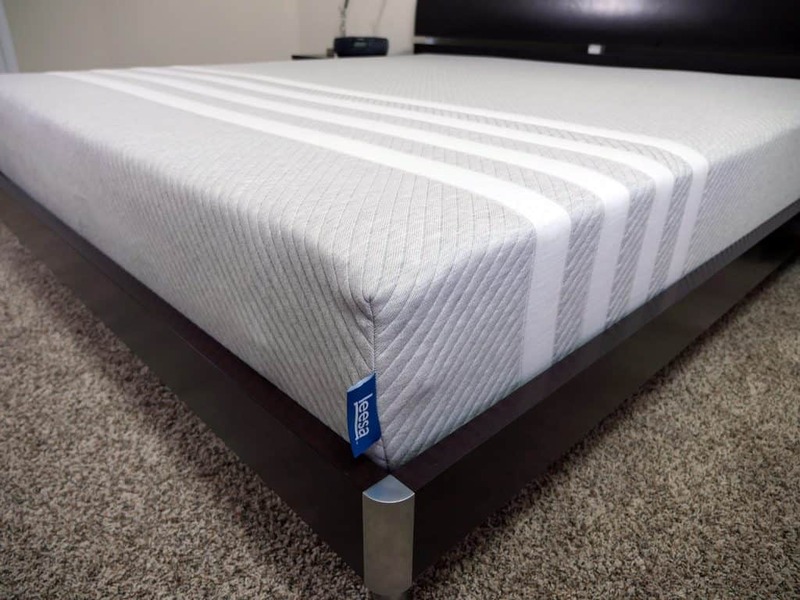 Bottom layer (foundation) – This base layer uses 4.0″ of high-density support foam to establish a strong support base for all of the layers above and help the mattress to retain its shape. The cover for the Helix mattress is 100% polyester, with a modern aesthetic and durable fee. The top panel is a white checkerboard pattern with contrasting blue used for the sides. The sides use a sturdier fabric as well, which helps the mattress keep its shape and quality. This cover is especially thin, with no added quilting or padding. The thinness helps with cooling and breathability while you sleep, as well as preserves the unique feel of this mattress. With this being a custom mattress, it can be difficult to discuss firmness, feel, and support, as each mattress will vary. Firmness, comfort, support, cooling, bounce, and other “feel factors” are determined by the results of the specialized mattress quiz. In this quiz, Helix asks a series of questions aimed at finding every sleeper the perfect mattress—even if he or she doesn’t know what that is. 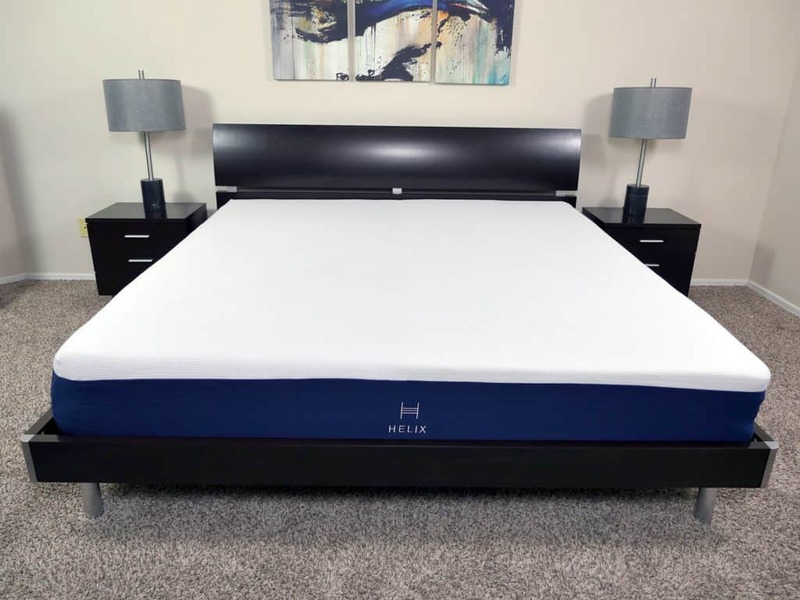 The Helix mattress quiz covers the following topics: mattress size, number of sleepers, gender, height, weight, body type, sleeping positions, cooling needs, firmness preference, medical issues, and any sleep-related pain. Upon completion, the results of the quiz are categorized into four different groups: point elasticity, support, feel, and temperature regulation. Point elasticity – This section looks at how the mattress contours and hugs your body at certain points. Support – Sleeping position, height, and weight are all factors that help determine what type of support is ideal, without creating uncomfortable pressure points. Feel – Feel reflects how soft or firm a mattress should feel and is determined by your preferred firmness. It’s important to remember that support and feel are not the same thing. A mattress can feel soft, yet still have good support. Temperature regulation – The last group factors in how hot or cool you sleep. Warm sleepers may need a special construction to help with mattress cooling and airflow, while this may not be as big of an issue for other sleepers. All of these factors are considered in order to create a mattress that is ideally configured for your needs. 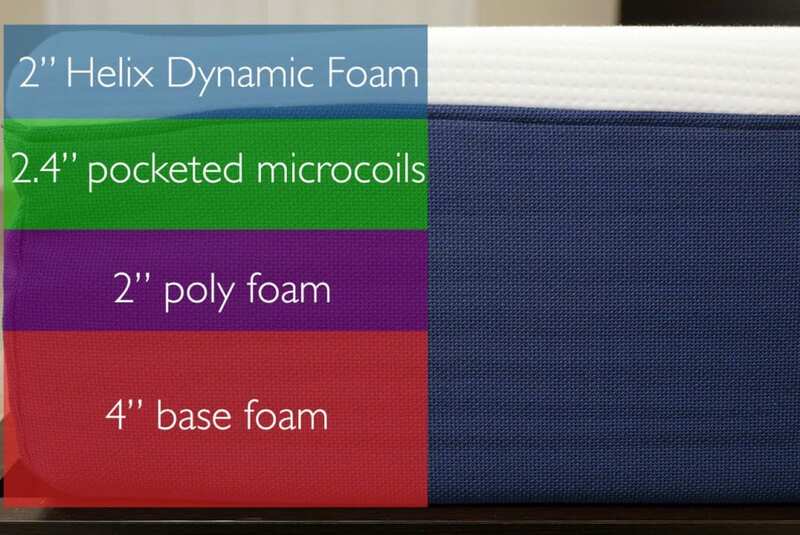 In my comprehensive Helix mattress review I tested 4 of the most popular Helix configurations. If you want a deep dive into the very specific feel attributes of each Helix I would highly recommend giving that review a read. 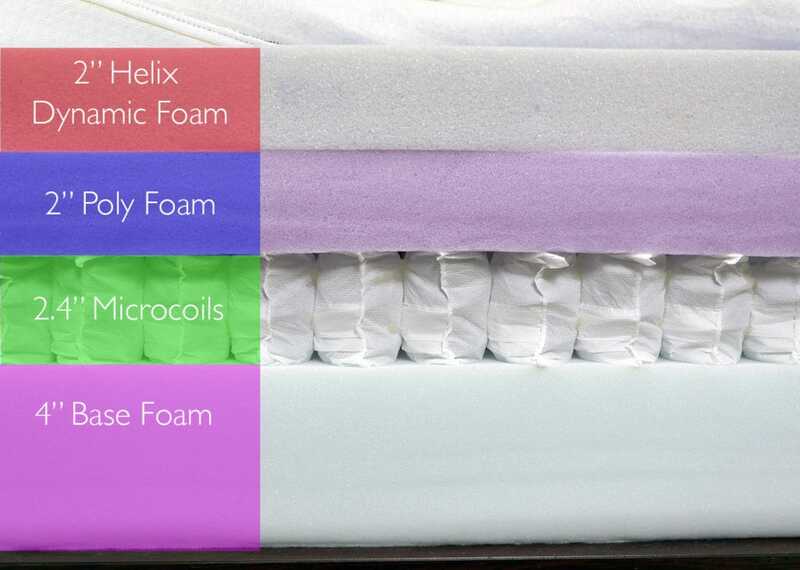 Helix mattresses have a wide range of firmnesses that can be achieved through their customization. The Helix mattress can be as soft as a 3 or as firm as a 9, and anywhere in between, on the firmness scale, out of 10, where 10 is the most firm. HELP: What mattress firmness do you need? Response – the Helix Dynamic foam, microcoils, and poly foam layers all work together to create fast response. The response time is essentially instant. Bounce – bounce will also be moderate to high on all Helix mattresses, as a result of the material combination. It won’t be as high as an all coil mattress’ bounce, but you can expect a good level of springiness. Cooling – again, the combination of poly foam (as opposed to a memory foam) and microcoils work together to breathe well and avoid heat retention. All of the Helix configurations I’ve tested did not sleep warm. Balanced Contour – while the depth of sinkage will vary depending on your configuration, all Helix configurations have more of a generalized and balanced type of a contour. This is in contrast to memory foam’s contour, which is more dramatic and more sharply shapes to your body. This configuration has a slightly softer feel and is ideal for side sleepers. It has a firmness of 5 out of 10. This configuration has a medium-firm feel and is a good choice for many different sleeper types and all sleeping positions. It has a firmness of 6-6.5 out of 10. This configuration has a medium feel with more sinkage. It’s great for lighter weight sleepers, in addition to both side and back sleepers. It has a firmness of 5.5 out of 10. This configuration has a firm to very firm feel and is best for sleepers who are heavier and/or prefer more of a firm and floating type of a feel. It has a firmness of 8.5 out of 10. Of course, this is just a sampling of the different types of mattresses that may be created, based on the results of your sleep quiz. Your exact mattress may vary from these results. What’s nice about the Helix is the ability to create something totally unique to you. This is also a nice feature for partners that have varying sleep preferences, since this mattress can be split. A split mattress will still look like one complete mattress, but the foam layers would be different for each side of the bed. This makes it a great mattress for couples. Read the full Helix mattress review here. Shipping – Free shipping to both the United States and Canada. Takes 1-2 days to make the mattress and 6-10 to arrive at your house. Refunds – 100% money back guarantee within the trial period. However, they do ask you try it for at least 30 days before deciding to return. The Leesa mattress is 10” and uses a blend of three distinct layers of foam. Unique to the Leesa is the use of its proprietary Avena foam. This foam performs similarly to latex, but is often more durable and has a longer life span. Top layer (cooling & comfort) – This layer is made of 2” of Avena foam. Avena foam has great bounce, cooling, and response. This provides a nice balance for the memory foam below. Middle layer (support & pressure relief) – The middle layer contains 2″ of memory foam, providing support and pressure relief. 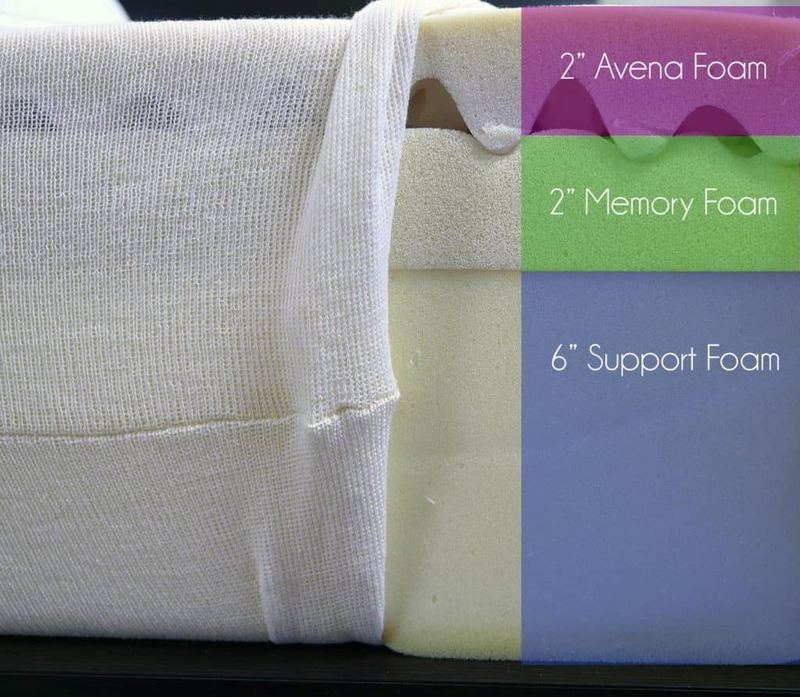 The integration of both memory foam and Avena foam results in a mattress that meets the needs of a wide range of sleepers. Bottom layer (foundation) – The base of the Leesa is a 6″ layer of support foam. This provides a strong foundation for the mattress, as well as deep compression for heavier sleepers. The Leesa cover is a blend of polyester and Lycra. The combination of these materials makes for a cover that is stretchy and durable with a nice degree of cooling. This seamless cover fits snug around the entire body of the mattress, keeping a clean and modern aesthetic. There are four simple gray bars designed into the cover that gives some design and visual interest at the foot of the bed. Regarding firmness, the Leesa is about a 6 out of 10, where 10 is the most firm. This firmness tends to hit that sweet spot of “universal comfort,” which a large variety of sleepers find comfortable. When you initially lie down on the Leesa mattress, there is a good degree of softness, comfort, and cooling from the convoluted Avena foam. As you begin to ease into the mattress, the memory foam gets to work, providing good deep compression, pressure relief, and support. These two materials working together creates a nice balance, without being exclusively one material. The Leesa has one of the most balanced feels of any mattress I have tested. The layer design, nature of materials, firmness, support, and thicknesses of the foams all work together to create a mattress that’s suitable for a wide range of body types, sleeping positions, weights, needs, and preferences. For those sleeper who are looking for that all-around mattress at a medium firmness I feel like the Leesa does an excellent job of striking an ideal balance across the board. Despite the use of memory foam, the Leesa has a fairly fast response time. This is a nice bonus for active sleepers and allows the mattress to respond and react to your body. I would consider the support of the Leesa to be very good. Although I am typically a stomach sleeper, I tested all positions on this mattress—back, stomach, and side. The Leesa felt very supportive and provided a balanced feel in all positions. Especially considering the price, the Leesa is an extremely versatile and budget-friendly option for many sleepers. Read the full Leesa mattress review here. Should I buy the Helix or Leesa mattress? All things considered, what is the verdict? Should you buy the Helix or Leesa mattress? There are some really great benefits to both of these options, and both companies attract a large variety of sleepers. That’s why this mattress battle is going to be a draw—but it does have a twist. The Leesa is an amazing mattress for sleepers looking for that 6 out of 10 firmness, moderate bounce, fast response, nice cooling, even pressure relief, and moderate hug. If you are looking for the perfect all-around medium mattress with a balanced feel the Leesa is the best choice for you. The Helix, however, is a better mattress if you’re looking for anything that weighs heavier towards one specific feel. Want more or less hug? More or less sinkage? Are you looking for a mattress that is extremely soft or extremely firm? The Helix can be customized to be as soft as a 3 out of 10 or as firm as a 9 out of 10 (with 10 being compared to as hard as the floor). In general, I think the biggest factor comes down to firmness though. If you are looking for a 6 out of 10 medium firmness designed with universal comfort in mind, go with Leesa. If you are looking for anything softer or firmer than a 6 out of 10 firmness and/or there are other specific needs and desires you have for the mattress feel / support, go with Helix. 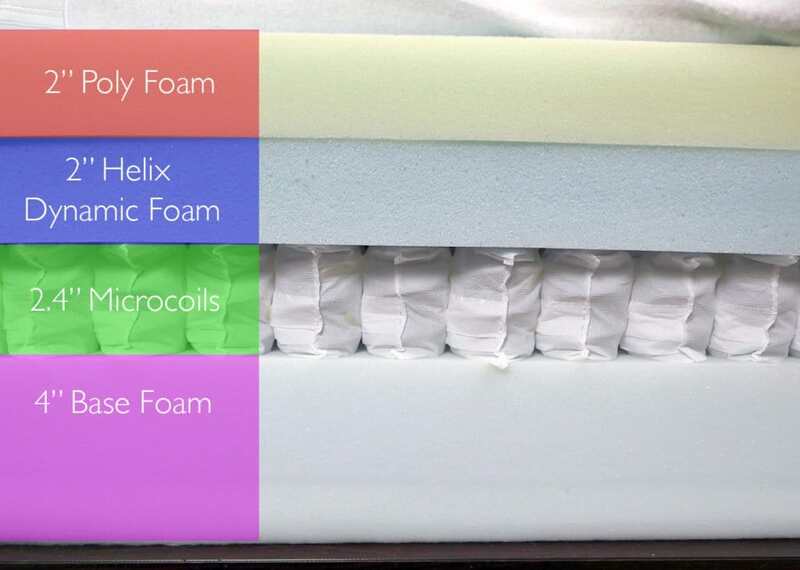 Want a custom mattress – The Helix is made from foam / microcoil layers that can be used to create a wide range of feels and firmnesses. 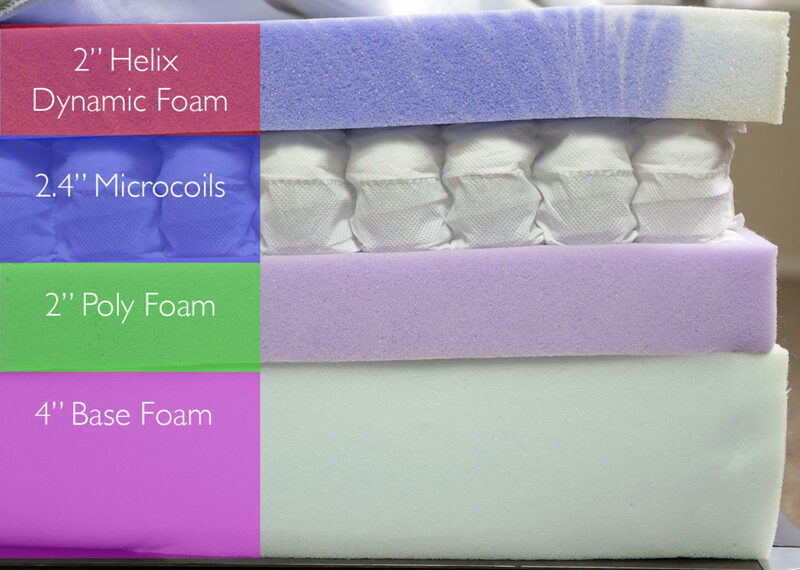 By adjusting the position of a certain foam, along with customizations to density and ILD value, Helix is able to mix and match its way to hundreds of different types of mattresses, all within one design. Want a split mattress – It can be hard enough to find a mattress good for one sleeper, even harder to find one good for two. 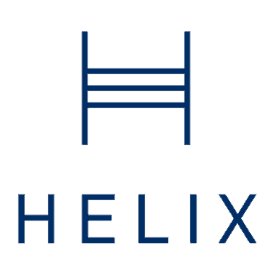 The ability to have a split mattress that’s sewn into one mattress is a big plus for the Helix. This is especially nice for a couple who is very different in size or just prefers very different firmnesses. Aren’t sure what you need – Purchasing a mattress can be confusing and understanding about all the layers and properties can be time consuming. The sleep mattress quiz can use factors like weight, height, sleeping position, and any notable pain during sleep to help determine the best mattress for your body. Want a medium firmness – Leesa really hits that sweet spot of a solid 6 out of 10 on the firmness scale. 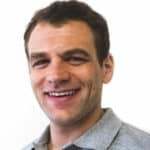 Most sleepers prefer a medium firmness (most surveys I’ve read and experts I’ve discussed with indicate that 70-80% of sleepers need a 6’ish firmness). Many sleepers find themselves in this zone, so instead of creating a mattress for the outliers, Leesa puts all of their effort into creating an exceptional mattress for the majority of sleepers. Want a balanced feel – The Leesa strikes a nice balance of materials, resulting in moderate bounce, hug, and sinkage, as well as great cooling. The Leesa is not too much of any one feel, which is what makes it a nice choice for so many sleepers. Aren’t quite sure what they want – Perhaps you are buying this mattress for a child who hasn’t really developed sleep preferences. Or, maybe it’s for a guest bedroom, so the sleeper’s preferences will vary. The Leesa is an excellent mattress in these types of cases when you don’t want a mattress that is too much of one thing, but still want something that is high quality (and the right price).